Many-Eyed Hydra's Succubus Bordello: Recently, I Have Been Reading . . . Conan! Recently, I Have Been Reading . . . Conan! Conan, lots and lots of Conan . 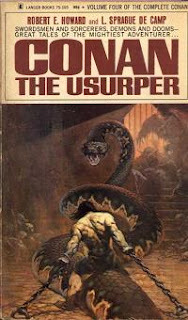 . .
Robert E. Howard’s Conan the Barbarian is one of those characters where you think you know who they are, but then you realise you only know the caricature of who they are. I read the L. Sprague de Camp-padded out paperbacks when I was a young lad because they were cheap and had lurid covers with warriors fending off snakes the size of double-decker buses. I came back to Conan because I had an idea for a story where the classic muscle-bound cliché of a barbarian is easily outwitted by one of my succubi. However, Howard’s Conan is a completely different beast. Multi-lingual, well-travelled, whip-smart, adept tactician; he’s a lot more than a dumb beast with a big sword. Despite this, Conan still manages to be in significant danger in most of his stories. Howard’s Hyborian world is a dark and dangerous place, filled with hostile tribes, dark magic and the occasional Lovecraftian abomination. While Conan is freakish by normal human standards, he needs to be to survive in that world, and often only does so by the skin of his teeth. The books I remember were padded out into paperback novels by de Camp. Howard’s original versions were stories that appeared within the pages of Weird Tales. With the exception of The Hour of the Dragon (which is still on my to-read list), the stories are all novella length. Despite the brevity, Howard managed to pack a lot of story in each tale. Given the doorstop-size of most fantasy epics nowadays, it’s astonishing to think one of the grandfathers of the genre managed to build his lushly detailed world within the slimline pages of magazines. And Howard’s world broods. Each paragraph sweats atmosphere and menace. I believe most of Howard’s stories are out of copyright now (tragically, he committed suicide at the young age of 30). I accessed them through Project Gutenberg Australia here. Well worth a read to appreciate just how good the early pulp masters were. As for my own muscle-bound expy, well you can see how they get on in my forthcoming collection, A Succubus for Freedom. Let’s just say they aren’t the real Conan . . .
Conan. Funny how most barbarian characters modeled off of him are rather... perhaps thick isn't the correct word but they aren't really smart. Conan's intelligence certainly belied his appearance. I don't know whether you play any tabletop RPGs, but if you do, there's a tabletop RPG called "The Day After Ragnarok". It's been described by reviewers as "Conan meets Mad Max", and described I think by its creator, Kenneth Hite, as "SMGs and Sorcery". Essentially it's a post-apocalyptic post-WWII world, where Hitler attempted to destroy the world using the Midgard Serpent, which was then nuked by the Americans. However its death throes poisoned much of the earth, along with flooding large parts of the North American continent. Much of Europe was destroyed, and the British empire was forced to move its capital from Britain, now destroyed, to Australia. The Soviet Union occupied what was left of Eastern Europe behind the "Serpent Wall", which is where the body of the Serpent fell and divided Europe, and parts of Africa I believe. "Know, O Prince, that between the years when the Serpent fell and the oceans drank America and the gleaming cities, and the rise of the Sons of Space, there was an Age undreamed of, when nations guttered low and flared brilliant across the poisoned world like dying stars – California and Texas each claiming the flag of the West, France torn asunder and facing the desert, harsh Mexico, slumbering Brazil, Argentina where the seeds of Thule lay waiting, ancient lands of Persia and Arabia and Iraq between two empires, the coldly clutching Soviet Union whispering behind its Wall of Serpent, Japan whose warriors wore steel and silk and khaki. But the proudest kingdom of the world was Australia, the last green and pleasant land, ringed around by its dominions and bulwarked by the sea." "Know, O prince, that between the years when the oceans drank Atlantis and the gleaming cities, and the years of the rise of the Sons of Aryas, there was an Age undreamed of, when shining kingdoms lay spread across the world like blue mantles beneath the stars - Nemedia, Ophir, Brythunia, Hyperborea, Zamora with its dark-haired women and towers of spider-haunted mystery, Zingara with its chivalry, Koth that bordered on the pastoral lands of Shem, Stygia with its shadow-guarded tombs, Hyrkania whose riders wore steel and silk and gold. But the proudest kingdom of the world was Aquilonia, reigning supreme in the dreaming west." Oh another interesting tabletop RPG, that uses the same system as the Day After Ragnarok RPG, is "Totems of the Dead". Essentially it's swords and sorcery using a pre-Columbian Americas (North and South)themes and setting. Quite different from the typical wuxia (East Asia) or medieval European fantasy setting. You can download both games for free from "4shared", which has pdf files of the rulebooks for them. Hehe, I did something similar with Poe's "Masque of the Red Death" with one of my stories. I've dabbled with various tabletop RPG's but never really got into them. I ended up moving on to more tightly constrained strategy games. It's true that most of the cliches tend to be musclebound simpletons. The idea I was going to write was supposed to be more like "Slayer vs Succubus", but it ended up falling closer to "Knight vs Succubus" (but not quite as dark). Looking forward to it, then, because those are two of my favorites. A Succubus for Freedom: We have a cover!